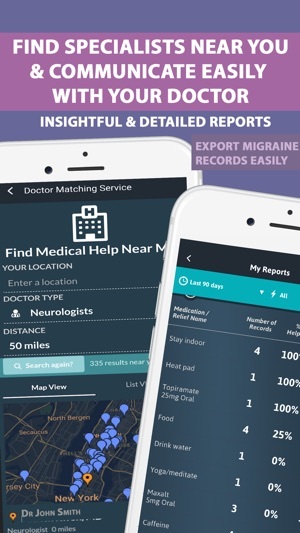 ▶More than 1 million downloads and rated as the #1 Migraine App◀ according to both patients and doctors, with advanced reporting & exports, automatic tracking of weather pressure and sleep! 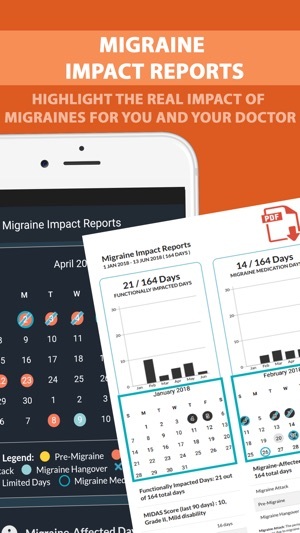 ▶ Migraine Buddy is an advanced migraine headache diary and tracking app designed with neurologists and data scientists. ▶ More than a migraine journal, Migraine Buddy will help you quickly record and identify all aspects of an attack, including migraine triggers, symptoms, medications, frequency, duration, pain intensity, location, and other lifestyle factors so users can improve their migraine condition. It will also help you track the impact of your migraine condition on your daily life. ▶ Migraine Buddy also provides an easy to read summary report for users to send to their doctor, employer, or insurance company, or simply for better personal understanding of their migraines. 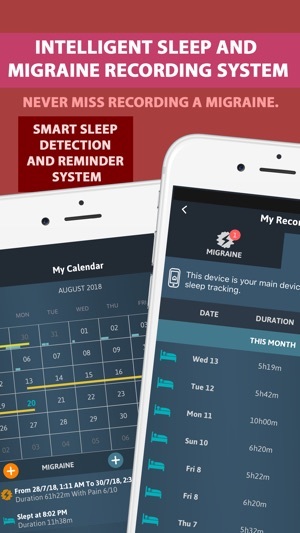 ▶ Migraine Buddy also features an intelligent sleep diary that allows users to see the correlation between their sleep and migraines via a newly introduced sleep graph. 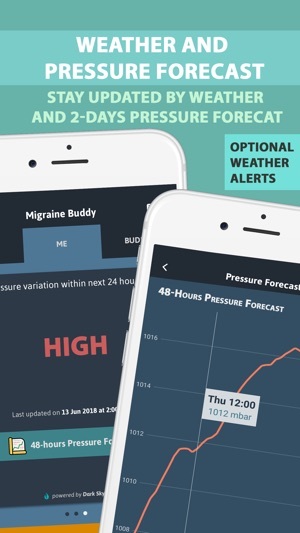 ▶ You will also be able to track the impact of weather pressure variations on your migraines and can be alerted by a notification of the next 24 hours forecast in your location. 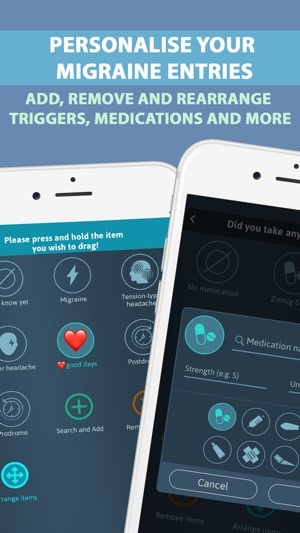 ▶ For chronic and high frequency migraineurs, the Migraine Impact Buddy will help you track on a daily basis your pain, symptoms and the impact of migraines on your life. ◆ Personalize every questionnaire screen by adding more icons, delete the ones that don't relate to your migraines and reorganize them all based in any order you want. ◆ Notes section to add additional information such as food, weather conditions, barometric pressure, mood, etc. ◆ Add a "Buddy": share your migraine status with your "buddies" within the app. Let each other know when you're migraine-free, having a migraine, and how you feel. This software is intended for use only for general wellbeing purposes, and is not intended to be used for any medical purpose (such as the detection, diagnosis, monitoring, management or treatment of any medical condition or disease). Any health-related information provided by this device or software should not be treated as medical advice. Please consult a physician for any medical advice required. We are excited to share a BETA feature to help with remembering possible migraine symptoms. You can see these symptom ideas after you've created a migraine, in the symptoms section. Have a migraine-free day ahead! This is the first app review I have ever slowed down to contribute. 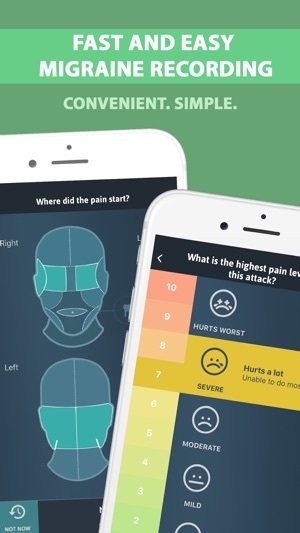 Working in healthcare it takes a lot for a health-related app to impress me and I have been extremely impressed by Migraine Buddy. I like that I can add in my sleep time rather than rely on the overnight feature, which may be great I just have not tried it yet. I downloaded this app while visiting a family member who has pets and triggered ongoing migraines for me. I love that I could use the connect-to-a provider feature to locate acupuncturists nearby. There is a lot of flexibility within this app that makes it very easy to use on the go, during an attack, and to catch up with after an attack. I really like that I can add notes to the day because I personally like to include what I’m eating especially if it’s something unusual or new to me so that I can see if it makes a difference in the coming days. At this time, if I made a suggestion it would be to offer a food journal as a complement to the app that can be used along side it for tracking and reporting. I really look forward to seeing how the predictability alerts will help me gauge and treat my migraines. 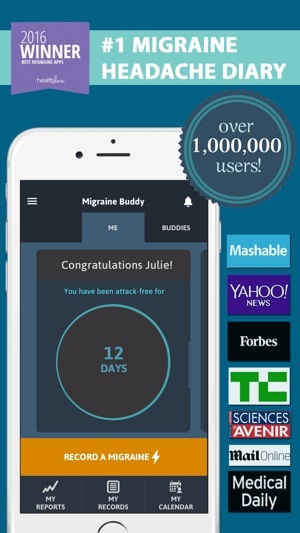 Life should only get better using Migraine Buddy! Thank you so much for your kind words. Your support goes a long way in encouraging the team. Food tracking is a development that we considered adding to the app. We identified 20+ chemicals in food that can raise the risk of developing migraine symptoms. This makes it too difficult to 1. track efficiently and 2. make correlations for our reporting engine. Instead, we have developed food tracking and coaching services to deal with food and migraines. specially designed for Migraine Buddy users who have a lot of migraines. Great App! With addition of forums-FANTASTIC APP!!! Thank you so much for this great review!!! I’ve tried so many ways of tracking my migraines over the years. This app is the first thing that has lasted for me. A friend suggested it two years ago and I show it off to anyone who will listen. I really appreciate that putting in a new episode is simply a matter of going through a grid of pictorial icons. Best of all I can add my own if I’m having a symptom or using a treatment that isn’t listed. It automatically tracks my sleep and local weather if I turn on those options do I don’t have to write them down anymore. Additionally I can send reports to myself as emails, PDFs, spreadsheets... the creators have provided many options and platforms so that my doctor and family know how to help me. Last but not least there are groups that I can join or ignore with people who are on the same meds, who have the same types of migraines, or who live in my area. So I can ask for advice if I want to. There are even areas where I can jot myself notes to accompany a migraine episode or sleep record. For times when I’m sick with the flu or the neighbors dog barked all night. I LOVE this app!